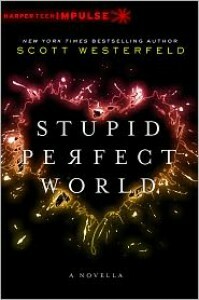 Stupid Perfect World: The point where I let everyone know I had some messed up dreams. This review is going to be full of spoilers. But considering it is a novella there is not much I can say about the characters, plot, and setting that wouldn't spoil the story. So your basic run down is the plot is interesting, the characters are actually funny at times, and I only found a few flaws in the story. So it starts out set in a world where teens teleport to their classes on different continents, don't sleep, have their hormones regulated, don't get sick, and they learn about the old world in a class called Scarcity. Kieran has to do a project for his Scarcity class and unfortunately Barefoot(what kind of parent names their kid Barefoot...honestly)Tillman distracted him before he could remember to put a reminder in his headspace to do research for choosing a topic. So on the fly Kieran chooses to sleep. He wonders how bad could it really be to lay unconscious for a few hours. The other main character in this short fiction, Maria, is a "meeker" (apparently this means nerd/overachiever), who has chosen to give up her hormone regulation for the assignment. Two weeks of teen angst, crawling skin, and uncontrollable urges. Kieran jokingly tells her not to start writing poetry. Which she actually ends up doing...cause you know teens naturally do that right off the bat. Ok, I did write a few poems as a teen, but not everyone does that. "It wasn't a real course with grades and everything, so only the most pathetic meekers worked hard at it. The rest of us just showed up and tried not to fall asleep." And if their hormones are so well regulated then why would his father deny him his request for a bed...and not even LISTEN when he tried to explain it was for a class project. Didn't really matter, Kieran made due by putting a bunch of parkas on the floor of his room. (Apparently dude either lives in Antarctica or he owns a lot of parkas because of his interest in building a snow habitat. 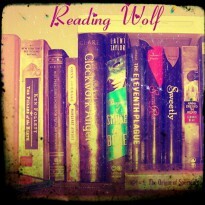 Even though somethings were a bit, come on that wouldn't happen, it was a very interesting book. I kind of wish it had been a full length standalone novel. I liked Kieran and Maria well enough, but the WORLD is the one I would love to hear more about.